Kyoto is a compact and easily accessible city. Almost any two points can be linked within thirty minutes. Kyoto is served by integrated rail, subway, and bus services. When you are not hurrying to a meeting or appointment, the best way to see and experience Kyoto is on foot. Kyoto welcomes many visitors each year and every effort has been made to make navigating public transport as easy as possible, especially for the non-Japanese speaker. The compact geography and narrow winding streets of Kyoto make the city a delight to stroll. Most distances are easily covered on foot, and if you take the long way around and the scenic route, Kyoto will reveal many of its delightful secrets to you that are normally hidden as people glide by on a train or bus. The streets are laid out in a north-south, east-west grid pattern that makes navigation and taking detours simple. Multilingual tourist information maps and signposts are located everywhere to give you hints of what places of interest to look for. Kyoto also lends itself to cyclists and bicycle rental is available throughout the city. Kyoto City Subway operates two lines: the Karasuma Line running north-south and the Tozai Line running east-west meet in the centre of the city at Karasuma Oike station. Subway stations are not only numbered in order, but have signs posted in Japanese, and Latin alphabet that indicate the next station on the route. Stops are announced in Japanese and English on the train. Guide to using Kyoto City public transport includes subway map and ticket guide. The national rail network provider, JR (Japan Rail), operates many services from Kyoto Station including Shinkansen bullet train routes to Tokyo and Osaka. It is convenient to use JR to travel from south of the city to Arashiyama and also to nearby places of interest such as Uji, Nara, northern Kyoto prefecture and further a field into Kansai and beyond. Kyoto City Subway connects at Kyoto, Nijo, Yamashina and Rokujizo stations. The Keihan railway connects Kyoto with Osaka. It can be used to access sightseeing attractions on the eastern side of Kyoto city such as Gion, Higashiyama, Tofukuji Temple and Fushimi. From the Kyoto terminal of Demachiyanagi station you can take the Eizan railway out to the Kurama and Kifune rural retreats. Keihan railway connects with Kyoto City Subway at Sanjo station. The Hankyu Railway runs east-west connecting the Shijo downtown area with rural Arashiyama and Osaka. It connects with the Kyoto Subway at Karasuma station, which is adjacent to Shijo station on the subway line. There are a number of other rail services in the city such as the Keifuku Line to Arashiyama from Shijo Omiya; the Kintetsu line south to Nara and other Kansai destinations; and the Sagano Sightseeing Tram open air services along the Hozu River gorge. Buses have destinations posted in both Japanese and English, as well as announcing points of interest in English. The new Raku Buses painted in distinct designs operate on the most popular tourists routes. These buses have clear signage in English, Korean, Chinese and Japanese and feature enhanced onboard announcements in English. A number of companies operate bus services in Kyoto city and to locations beyond. JR Bus and Kyoto Bus serve city and surrounding places of interest. There are also long-distance bus services to other regions of Japan that depart from Kyoto station. Locate the ticket machines for the rail service you want to use. These are usually close to the platform gates. Check the fare to your destination on the chart above the ticket machines (Kyoto City Subway stations are numbered as well as named, making it even easier to spot your destination). 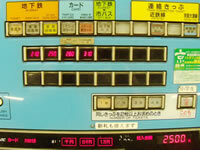 Feed the fare amount into the machine in either coins or notes (bills). Credit and debit cards are not accepted (except for the shinkansen bullet train and some long-distance services). Buttons will illuminate on the machine when money is fed into it. Press the button that represents your fare. A ticket and your change will be issued. Feed the ticket into the platform gate. The ticket is returned to you on the inside of the gate. You will need the ticket to exit your destination station. Tip: If you are not sure of the fare or are in a rush to catch your train, buy the cheapest ticket. When you get to your destination, use the ‘fare adjustment’ machine near the exit gates to pay the difference. Child fares are usually discounted. Choose the child fare button on the machine to issue a child fare ticket. If you are using a travel card , you do not need to buy a ticket and simply feed the card into the platform gate. Remember to collect the card each time. 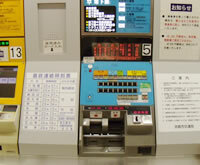 Hint: The above photographs are of Kyoto City Subway however all rail ticket machines and signage are similar. You buy bus tickets on the bus. The following is the basic process. Get on the bus through the rear door. Take a ticket from the machine at the door. Check the ticket number against the electronic bulletin board at the front of the bus. The fare is displayed next to the number that corresponds with your ticket number. Put the ticket and the fare into the slot next to the driver as you leave the bus. If you do not have exact change, there is a change machine located next to the driver. You should prepare the change well before your stop so that you do not hold up other passengers or the progress of the bus. Most bus trips within the city centre cost a fixed 220 yen fare for adults. If you are using a travel card or discount card , you should feed the card into the card reader as you get on the bus and as you get off. Taxis can be hailed anywhere in the city by raising your arm. You are most likely to find a taxi on a more major thoroughfare, near busy stations, and at popular shopping or sightseeing areas. It is recommended that you know the address of your destination if it is not a major landmark. Taxi companies also offer sightseeing tours with drivers who are professionally licensed to guide in English. Taxi fares include a service charge and tipping is not practised. Expect to use cash to pay your fare, but credit cards are accepted in more and more vehicles. There are a number of travel passes and cards available to make your journeys even cheaper and even more stress free. A summary is offered here. Unlimited travel on Kyoto City Bus Zone 1 routes (most of the central city and sightseeing areas) for just 500 JPY for adults and 250 JPY for children. Buy at subway and bus vending machines and a Bus Information Center at Kyoto station. Unlimited use of both subway lines and all stations for any given day for 600 jpy. Buy at subway and bus vending machines and a Bus Information Center at Kyoto station. Unlimited use of Kyoto City Subway and Kyoto City Bus Zone 1 routes (most of the central city and sightseeing areas) for 1200 JPY for adults and 600 JPY for children. Buy at subway and bus vending machines and a Bus Information Center at Kyoto station. Unlimited use of Kyoto City Subway and Kyoto City Bus Zone 1 routes (most of the central city and sightseeing areas) for 2000 JPY for adults and 1000 JPY for children. Buy at subway and bus vending machines and a Bus Information Center at Kyoto station. Available from Kyoto City Transport vendors and subway & bus vending machines in either 1000 JPY or 3000 JPY denominations. A 1000 JPY card provides 1100 JPY worth of travel and a 3000 JPY card 3300 JPY on and Kyoto Subway and Kyoto City Bus route. 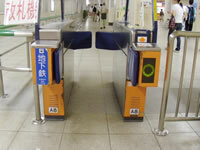 Ticket prices are deducted as you pass the ticket through the station entrance gates and bus card readers. Remaining credit is printed on the back of the card. Can be used on the Kyoto City Subway, Kyoto City Bus, Keihan, Kintetsu and Hankyu railways. The card does not give any discount but it does take away the need for feeding cash into ticket vending machines and the one pass can be used for multiple service providers. Discount tickets for certain destinations like Osaka and Tokyo can be purchased at ticket shops located throughout the city. Unlimited travel on JR national services for set time period. Must be purchased before arrival in Japan.